11 Apr What are the best ways to get .edu and .gov backlinks? We know that .gov and .edu are the most known top-level domains. However, they could give high values for SEO of your business. The search engines always give superpowers to your .gov and .edu backlinks. Thus, the link builders try to get the backlinks from these domains. 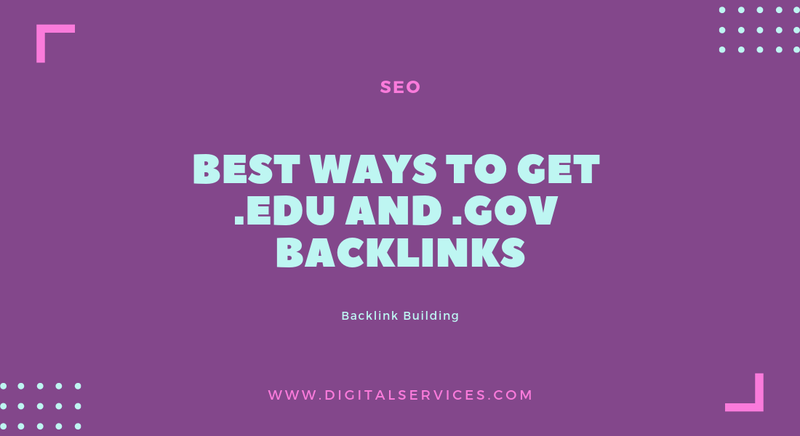 We have now helped you to obtain .edu and .gov backlinks very easily. Several colleges give an opportunity to the students for blogging on the .edu domain of their institute. You may find an advantage by networking with those students. You can pay some of them for writing blogs with a link, directing to your site. You can visit the sites, like Fiverr or Craigslist to make a listing, which attracts students for blog development on .edu domain. They will help you for backlinking your site. The resource pages are helpful to get .edu backlinks and different other backlinks. On these pages, you can find list of various backlinks that interest the teachers and students. However, you have to take time to find out nice-related resource pages, which can link to your website. The .edu platforms always link the content to something, important to the learners. Thus, you have to create the best resource that helps the colleges learn about your webpage and its value to the students. Most of us love having discount offers on our preferred services or products. You can rely on this fact for finding .edu backlinks. However, you must have some services or products, which attract the college faculty or students. Several educational institutes have special webpages, displaying the faculty and student discounts. You have to research on the type of discounts, shown on these pages. Then, you can align your own offer with those pages. The best way of having .gov backlink to your platform is to find government websites and blogs and leave your comments. However, it may not be always easy for you to apply this trick. Most of the government websites do not give a chance of making comments. The most important thing is that they delete the irrelevant, low quality comments. Thus, make sure that you have made a valuable comment on the blogs. Find an active member of government agency for the interview. However, your business website has to be relevant to the interview topic. You can publish the interview-related information on your site and insert a link, directing the chosen government unit. You may write some high-quality blogs on any government unit, and it can pull its attention to your site. You can target foreign or local government agencies in this way. Similarly, you may also write articles on any politician of your country. For instance, when the politician has proposed new legal rule, you can write about its effect on your business. Link your article to the politician. Follow the above tips to get backlinks to your site from .edu and .gov domains. These high-authority domains will make your website more reliable.